The NHL is adding an expansion team in Seattle. With this addition, the League will now consist of 32 franchises. The group is co-owned by David Bonderman, the founding partner of TPG Capital (formerly Texas Pacific Group). The Seattle franchise will be ready to compete in the 2021-22 season. The Washington Redskins have lost two quarterbacks to injuries in the past few weeks and have a somewhat shaky Mark Sanchez now at the helm. The team is still in the playoff mix so considering some other quarterback options, but according to coach Jay Gruden, Colin Kaepernick is not part of the discussion. Kaepernick is still pursuing a collusion case against the NFL and has been unsigned since 2016. 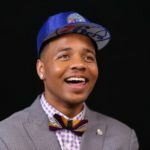 Philadelphia 76ers Markelle Fultz, the #1 overall pick in the 2017 draft, announced he has Thoracic Outlet Syndrome (TOS) which, according to his agent, “affects nerves between the neck and shoulder resulting in abnormal functional movement and range of motion, thus severely limiting Markelle’s ability to shoot a basketball.” Fultz will begin physical therapy and is expected to miss 3-6 weeks. Many critics believed Fultz’s shooting issues were psychological, but with this new diagnosis, it appears Fultz really has some physical issues and can hopefully get healthy soon.